Each year, Coastal Virginia Magazine readers vote for their top picks in notable businesses, restaurants and education institutions in the Hampton Roads area. 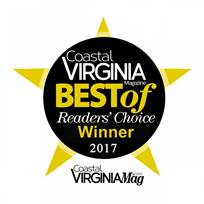 Coastal Virginia Business (CoVABiz) also noted Regent’s School of Business & Leadership (SBL) as a 2018 Gold Winner in its Best of Business awards in the areas of Best Business School and Best MBA program. Gomez attributes this recognition from the community both to “God’s glory” and the faculty, staff, students as well as the alumni of the school.